-Above average stamina lets him take hits decently well. -While he does have options to get closer on the opponent, those options have notable recovery. -Basic attacks don't reach very far. Low Smash (Back + Punch) - Quite a bit of startup but it moves Urban Champ forwards and it can be cancelled off of or linked into a light basic attack. High Punch (Punch) - Comes out the fastest and is safe but it's the easiest to block. Sweep Punch (Kick) - Needs to be blocked low and it knocks down. Comes out fast but is unsafe. Head Smash (Hold Up) - Needs to be blocked high. Does the most damage and is the safest of the three but the startup is longer. Rising Upper (F, D, DF, Punch or Kick) - Urban Champ does a shoryuken jumping uppercut attack. Punch version travels the least forwards but has invincibility at the beginning. Kick version drops the invincibility for more damage and Urban Champ preforms a short dash. The punch version can be cancelled into a super from the first hit. They're also unsafe on block as well. Spin Punch (F, F) - Urban Champ dashes forward while being invincible to projectiles. This invincibility wears off after the punch is thrown. Dodge (B, B) - Urban Champ turns around, extending the invincibility until he throws the punch out. You can also use the Spin Punch during this. Fistful Fury (F, DF, D, DB. B, Punch or Kick) - Urban Champ throws out a punch, proceeds to unleash a few more punches and then knocks the opponent out. Urban Champ's most damaging special attack and it does quite a bit of chip damage although it is unsafe. Punch version leaves the opponent standing but it's cancellable at any point. Kick version knocks down and does a bit more damage but can't be cancelled out of. Power Launch (Quick Dash, Punch+Kick) - Urban Champ throws out an uppercut which on hit, launches the opponent and causes them to float downwards. The move is also safe on block. EX Fistful Fury F, DF, D, DB. B, Punch+Kick) - Basically does more hits and even more damage while still being cancellable. Triple Rise (Level 1) (D, DF, F, D, DF, F, Punch) - Urban Champ does three jumping uppercuts that can do up to a total of 8 hits. This works really well in juggles and can combo from almost all his specials. Urban Champ is also invincible before the first leap off the ground. Flowerpot Toss (Level 1) (D, DB, B, DB, D, DF, F, Punch) - Urban Champ tosses a flower pot at the opponent. The flower pot flies at where the opponent was when Urban Champ tosses the pot. Upon getting hit, the opponent becomes dizzy on getting hit. It is possible to juggle into this move but the opponent won't be dizzy and the damage from the flower pot is quite weak. Scapegoat (Level 1) (D, DB, B, D, DB, B, Kick) - Urban Champ whistles and acts completely innocent. If he gets hit with a basic attack at the beginning of the move, he flies back and a police car drives into the opponent. 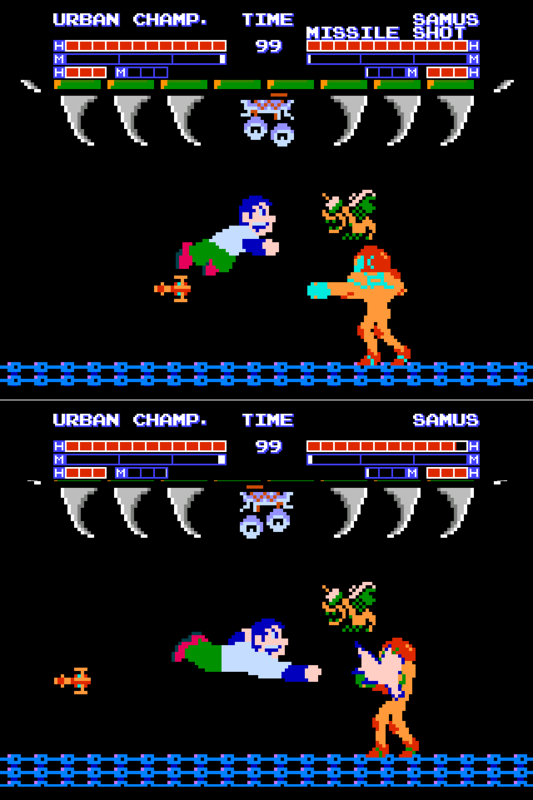 Sewer Brawl (Level 3) (D, DF, F, D, DF, F, Punch + Kick) - Urban Champ unleashes several punches and if the uppercut at the end hits, the opponent gets knocked into a manhole. Urban Champ proceeds to follow the opponent and continues beating them up. 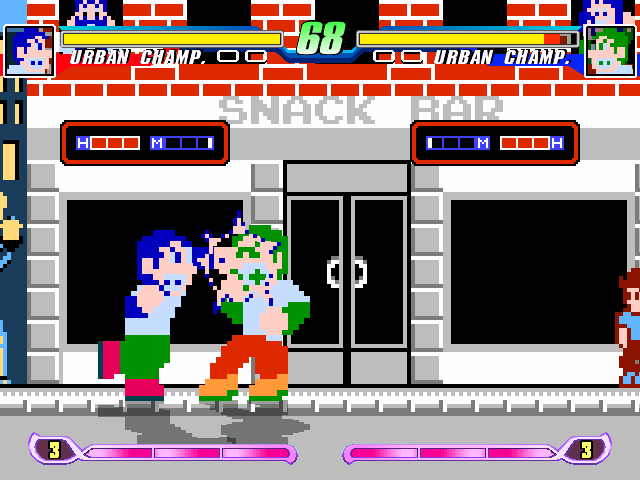 Urban Champ is completely invincible during the first punch. Arrested! - Defeating the opponent with Scapegoat causes the policeman to grab the opponent and take them into his car. Thanks for this, Urban Champ always felt too strong for his own good.He played like a fighter with that one good move and ran with it. Even though he is my main, he needed a well deserved rework. He still looks good but not cheap to play with. Great release! I was wondering, are you working on a new character? @Noside: Right now, Kid Niki is still being worked on. --Pause menu now displays the controls to navigate it. see XI. Known Issues/To-Do), the helper health and meter is always set to max. --The general controls will update now if you use the six button scheme. Notes on how to change the portraits. --Fixed Urban Champion being able to air recover even when it's disabled. --Readjusted Urban Champion's jump speeds. --Spin Punch and Dodge now use new commands (Back + Punch, Back + Kick) but the input window during Counter Attack has been reverted. --Balloon Fighter's Flipper has been reworked; it's now blockable but on hit, it flings the opponent forwards. After throwing, Balloon Fighter will attempt to fly away as fast as he can. --Fixed an issue where Bubbles' stun wave and Balloon Fighter's attacks in general were not counting towards the juggle counter. --Readme changes: Added the 6-button scheme command for Sewer Brawl. --Buffer system has been replaced with Jesuszilla's/Vans' buffer system. --Urban Champion has the ability to summon helpers in the air. --You can now summon helpers mid-attack; this however requires double the helper meter to preform. --All air attacks do the same hitstun to grounded opponents as Jumping Light Punch. --Urban Champion resize has gone from 1.38x to 1.4x to match Thonolan's resize. -Fixed a bug where you couldn't summon mid-attack in Simul mode. Fixed issue of opponents not falling into the hole during Sewer Brawl. Removed shadows for the police car and the flower pot in the intro.